YES IT’S CHILI IN A MUFFIN! I bet you thought this was just a cheesy cornbread muffin with chili powder but NO it’s a Cheesy CHILI Cornbread Muffin. No need to cook up a pot of my Turkey Chili or Mr. CBB’s Slammin Chili with these because I’m giving you the cornbread muffin and the chili all in one. The Chili Pepper is widely used around the world but did you know it’s spelled differently which is why you may see chile con carne, or chilli con carne. Now that Fall is in the air and back to school is in full swing for the kids I’m busy in the kitchen using my free time to create delicious recipes for my family. If I can make ahead and freeze meals to make week-night cooking easier, I’ll do that. I have used this basic chili cornbread recipe for years as it was in one of my old recipe books which I can’t seem to recall. I have tweaked the cornbread recipe to my liking through trial and error by adding various spices, hot sauce and herbs. If you are lucky to have fresh herbs on hand certainly use them instead of the dry herbs for blast of herb in each bite. I’ve also reduced the salt content too, as you can always add but not take away. I usually stick to this method in all of my cooking as there is always way too much salt in a lot of processed foods this also why I like to cook from scratch as I know exactly what goes into every recipe. I’m sure I’m not alone and many other home cooks enjoy creating something that they know they won’t find at a grocery store. So I try to reduce the salt content as much as possible when I bake or cook especially when a recipe calls for baking soda and salt. What some people don’t know is that baking soda already has salt in it and most times you won’t need to add much more salt if any at all. Now this cheesy chili cornbread muffin recipe is super filling and I found that a serving of one or two muffins is more than enough for one person along with a garden salad loaded with veggies. You could even make this cheesy chili cornbread muffin recipe in a loaf tin and serve it up like meatloaf. Use your imagination and see what you can create. Whichever way you make these chili cornbread muffins you won’t be disappointed. It’s hot spicy flavour along with the chili is great for these cool autumn nights, and ideal for those days you don’t want to cook. These only take a few minutes to heat up and serve from frozen and will stay up to a month in the freezer. 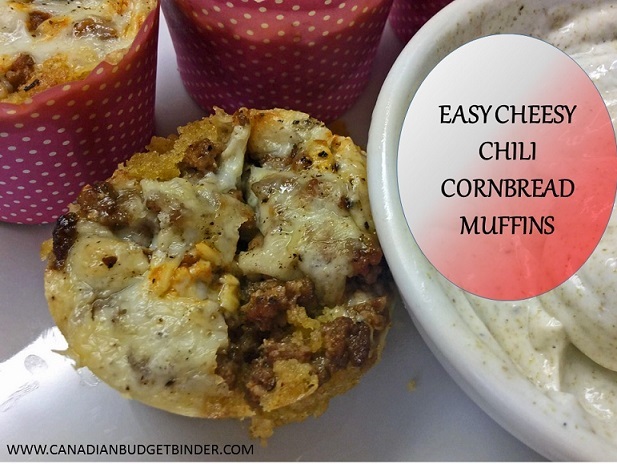 It really does have chili in the cornbread muffins not just the spices but the real deal and it's super cheesy too! In a large bowl, mix all dry ingredient together, then incorporate the buttermilk and add the melted butter and eggs. In a bowl mix together the crushed tomatoes, herbs, hot sauce, paprika and ground pepper. Add this too the ground beef/chicken until combined. Bake in the oven for 15 mins in oven. Enjoy this easy cheesy chili cornbread muffin as a hearty change from plain old chili and top it off with sour-cream and chives. Subscribe to Canadian Budget Binder so you get my daily email and Follow me on all the popular Social Media Outlets. Get every recipe from Canadian Budget Binder> Check out my new Free Recipe Index. If you like FREE then click this link for my FREE Excel Budget Spreadsheet and lists. Check out my new Ultimate Grocery Shopping Guide. It looks very delicious! Thanks for this wonderful recipe! Sure sounds yummy!!!! Even hubby might like it here and he can be a fussy one!!! Thanks for the recipe Nicola!!! If you try the recipe let me know. I always like to hear what others think and even if they change it up a bit too. It’s all about experimenting! These sound so tasty and so easy to take from the freezer to pack a quick lunch for work! I usually put a 1/2 teaspoon of cacao powder in my chilli… It gives the chilli a rich taste. I wonder if it would work for these. What do you think? Thanks so much for the recipe. I can’t wait to try it out! Mary if that’s how you like your chilli great I may even try this myself it sounds integuingly naughty but good lol. Chocolate in anything must be good! This Cheesy Chili Cornbread Muffin seems so exotic and very interesting to taste. I agree sour cream is perfect for this muffin. So excited to try it out myself. Thanks Nicola for another recipe. It does and perfect for a Fall day like today in Canada! You will not be dissapointed. Tell the truth we even like these cold too so I can use these for the kids lunches too!